Fresh, glowy and hydrated skin is always the best strategy for looking eternally young and vibrant. Today, a great treat: Chantal Moore shares a serum today that plumps, hydrates and refreshes your skin using your skin’s own molecular structure as a guide! This is big, big, big beauty with a conscience. From Chantal: ” If you’re not yet familiar- Hyaluronic Acid is known as “Nature’s Moisturizer” because this Hydrophilic molecule occurs naturally within the tissues of our skin. Over time, with age, we lose Hyaluronic Acid as the body produces less and less of the molecule. 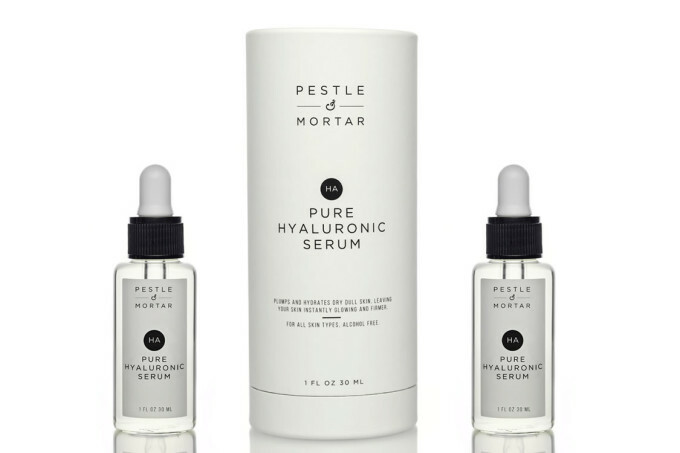 This paraben free, fragrance free, Pure Hyaluronic Serum from Pestle & Mortar hydrates, plumps, smooths fine lines and restores skin’s radiance and elasticity. This formula is super lightweight, suitable for all skin types (even the oiliest) and absorbs instantly- providing skin with a perfect platform for further treatment or makeup. Pestle & Mortar Pure Hyaluronic Serum is cruelty free and contains no animal ingredients. Previous post: Raw Cherry Cheescake!